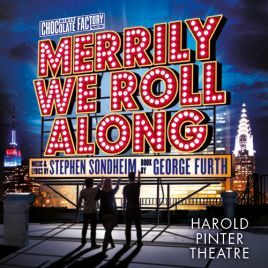 Merrily We Roll Along is the quintessential Sondheim show. From the moment the overture begins, we’re thrown into the sprightly, staccato jazz score, filled with Broadway tunes and brilliant orchestration, whilst in each number the intricate vocal parts interweave and overlap in typical fashion. Yet, as with all of Sondheim’s musical plays, the music is always an integral part of the drama. The central concept of Merrily is its reverse narrative: we initially meet composer Frank, lyricist Charley and critic Mary as three people whose friendship has broken apart, slowly moving backwards in time towards the very beginning of their friendship and their first musical ventures. What ensues is a compact drama that explores the nature of human relationships, in addition to semi-autobiographical elements such as the difficulties of collaboration and the artistic integrity of Broadway versus ‘selling out’ to Hollywood. The piece ultimately becomes a comic celebration of youthful optimism that resonates with all ages, but one tinged with sadness as the tragic ending is already known. It asks us to question: if we could start our lives over again, what might we do differently? The reverse structure allows for some typically Sondheim reminiscences. As with Sweeney Todd, the recurring title theme provides structure, whilst song reprises take on new significance at different points in the drama, foreshadowing events yet to be played out. And whilst this may seem overtly clever, the show is never less than thoroughly gripping and enjoyable with plenty of tunes to keep you entertained. When the musical itself is this good, the production comes easily enough. The creative team have thus kept the set simple, clean and crisp with appropriate 70s and 60s costumes to suit each time period. The only moment of extravagance comes with the tap routine during the play-within-a-play that opens the second act. This number also throws into sharp relief the otherwise naturalistic performances. The (reverse) character development of the central three protagonists is well-executed, each becoming noticeably younger before our eyes. Mark Umbers (Frank) and Damian Humbley (Charley) offer incredibly polished performances – in particular, Humbley’s version of ‘Franklin Shepard Inc’, with its complex web of singing and sound effects, is hugely impressive. Jenna Russel’s vocal as Mary is less secure, but her comic timing more than makes up for this. In addition, Clare Foster’s performance as Beth features some tender singing, whilst Josefina Gabrielle excels as the Broadway diva Gussie. “There’s not a tune you can hum”, complains a producer in one of the later numbers, a critique that Sondheim himself knows all too well. Merrily is Sondheim at his best, proving the critics wrong. Thankfully, judging by the amount of five star reviews this particular, exceptional production has received, the critics are most definitely on-side this time. You can add this reviewer to the ever growing list. Watch: Merrily is running until the 27th July, info here.